If you are seeking a wellness focused haven in which to be nurtured, pampered, and rejuvenated you have found your place. At Soak Spa & Foot Sanctuary in Fort Collins, we pride ourselves in offering a local tradition from New Orleans called “Lagniappe” (A Little Something Extra). Guests are served our signature ginger tea and a light snack along with robes and sandals while experiencing one of our indulgent spa packages or foot soak treatments in our Foot Sanctuary. Our selection of holistic spa services include our specially blended essential oil inhalations, heated aromatherapy packs to relax tight muscles, and feet wrapped in hot towels to conclude your service. If you’re looking to reduce stress, pain, or muscle tension then our deeply encompassing massage, alternative body therapies, and body treatments provide the healing and renewal you need. We have highly experienced, educated, and passionate therapists that are dedicated to helping our guests feel better physically and emotionally. If you wish to unwind with a partner, friend, or family member we have the perfect couple’s suite in which to enjoy a varied selection of couple’s packages crafted for two. 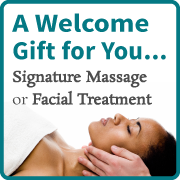 You may be searching for a spa that focuses on holistic facial treatments. At Soak Spa & Foot Sanctuary, we strongly believe that outer beauty comes from inner health and balance, and we are passionate about helping our guests achieve radiant skin through our wide range of holistic facials and advanced skin care treatments. Whatever your goals may be, our skilled and knowledgeable skin therapists will facilitate restoration and visible transformation of your complexion with organic and local products that are free of harmful chemicals, preservatives, dyes, fragrances, and never tested on animals. Our wish is for your skin to be healthy, vibrant, and beautiful from the inside out. The Foot Sanctuary is a tranquil space where guests can gather and share in a truly unique spa experience centered around our healing and nourishing foot soaks. Here, guests rest in plush chairs and place their feet in beautiful copper bowls filled with heated water and nourishing herbal blends tailor mixed specially for you with only the highest quality salts, organic herbs, flowers, and essential oils while shoulder, neck, scalp, feet, and lower leg massages are offered to soothe and rejuvenate the mind, body, and spirit. When combined with a soothing ginger tea, these treatments relieve the body of toxins and negative energies. Soak Spa has a heartfelt desire to provide a peaceful oasis where guests can let go, breathe deeply, and receive healing touch in an environment that is nurturing and safe. Our wish is for you to feel relaxed from the moment you enter the spa and when leaving to feel revitalized and refreshed. Expect to be treated with value, kindness, and professionalism. We believe in building time into our scheduled appointments with you so you never feel rushed. We promise to take the time to listen to your specific needs and requests as well as recommend practices that best serve your goals. Please turn off all cell phones and electronic devices upon entering the spa. This is for your benefit, as well as the comfort and security of those experiencing relaxation at the same time. Our goal is not just to persuade customers to pass through our doors. Instead, we hope each customer leaves the spa feeling empowered to face whatever comes their way. Our services provide the renewal you need to find harmony and balance in your life. At Soak Spa & Foot Sanctuary, we let you escape your world of responsibilities, stress, and chaos into an oasis of inner peace. Each breath you take in our spa will manifest a deeper sense of self-love, tranquility, and resilience. Our passion extends to our practice as therapists as well. Founder Melissa Stewart, an experienced holistic skin therapist, was raised in New Orleans, and has worked in the spa industry since 2008. In everything we offer at the spa, we embrace wellness. We provide an oasis from stress, a healing touch, a kind word, a place to let go and breathe slowly, deeply. We nourish the joy of wellness in your lives and in our own.